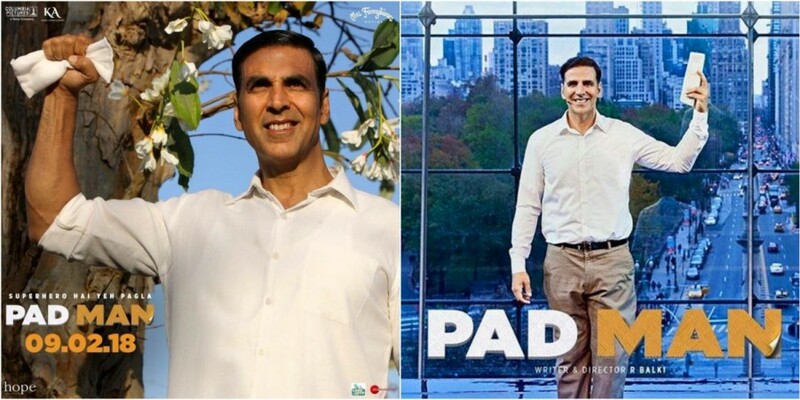 Akshay Kumar impresses Bollywood celebs with his performance in PadMan, while critics have mixed reviews on this film. R Balki's PadMan has hit the screens on February 9. It stars Akshay Kumar, Sonam Kapoor and Radhika Apte. Several Bollywood celebrities and critics have watched the movie and given their reviews about the film and actors' performances. While the celebs couldn't stop praising the Khiladi actor and Balki's direction, critics have given mixed response. Akshay has, as always, impressed with his performance, while the other actors have given their best as well. Celebs have called it "inspiring", "empowering" and "uplifting." This is the first time Sonam is appearing on screen after her amazing performance in Neerja. Her role in PadMan looks quite interesting. Incidentally, she has a tough competitor in Radhika Apte in the R Balki directorial. Radhika has been one of the finest actresses in the industry and Sonam has recreated her Neerja magic. PadMan is based on the real-life story of Arunachalam Muruganantham from Tamil Nadu, who invented a machine to create low-cost sanitary napkins and revolutionized menstrual hygiene in rural India. As it is getting a solo release, PadMan is expected to have a wonderful opening at the box office. Vickey Lalwani of SpotboyE said: "Team Pad Man- Akshay Kumar, the two leading ladies, captain of the ship and the producers Prernaa Arora & Twinkle Khanna- deserve a big pat on the back for giving us a sensible and entertaining film." Saibal Chatterjee of NDTV said: "PadMan is a well-intentioned film that derives strength from Akshay Kumar's gusty performance although he isn't strictly the right fit for the role of a just-married man. Radhika Apte is, as always, a scene-stealer. She contributes majorly to ensuring that the exchanges between the protagonist and his wife do not veer into corniness. Sonam Kapoor, who surfaces well into the second half, makes the most of the limited opportunity." Devansh Sharma of Firstpost said: "Padman packs in a lot of meat within 2.5 hours but most of it is the concentrated second half whereas the first one stands diluted. Balki's direction elevates the film almost as much as Kumar's charged portrayal. It is certainly one of the best in his career so far. An extra hoot to Padman for being the first mainstream film to dare address what has long been stuck between the legs. A small film (Phullu) did try to make its presence felt last year, but Padman has proved to be not only a bigger but a better film." Nandini Ramnath of Scroll.in said: "Pad Man tries to offset its intrinsic earnestness by adopting fast cutting and endless action, but the complexity of Laxmikant's battle against stigma and prejudice is lost in the process. Manufactured momentum doesn't often translate into momentousness." Sweta Kaushal of Hindustan Times said: "While Radhika disappears into the naive, blind-folded woman who believes "auraton ke liye sabse badi beemari hai sharam", Akshay tries his best to be the superhero he has come to be identified with in his films. Only, Akshay's accent and tone often fluctuate between those of a villager, a person with the basic knowledge of English and someone who is educated enough to differentiate between American and British accents. Sonam plays a privileged South Delhi girl and fits perfectly in the role." Madhuri of Filmibeat said: "Kudos to Akshay Kumar for taking up a subject that's generally spoken in hush-hush tones fearing the 'stigma' attached to it. To bleed or not to bleed isn't a woman's choice. It's a natural process which makes humankind a possibility and needs to be viewed as a 'moment of empowerment'. PadMan is definitely a 'bravura' step in this revolution despite of its own set of shortcomings." Renuka Vyavahare of Times of India said: "Known for making films that work towards bridging the age and gender gap, Balki's Padman is an empowering film that gives you the wings, despite the odds. It will free women of their inhibitions and that will be its biggest success. Period!" Rohit Bhatnagar of Deccan Chronicle said: "Akshay Kumar is convincing in his act that not even a second you will feel disconnected to his pain. But still his emotions and variations as an actor is quite similar to those of Jolly LLB 2 and Toilet. Radhika Apte is raw, real and true to life. Sonam Kapoor is just about average as she is strictly a one tone actress. Cameo of Amitabh Bachchan is refreshing but mandatory, courtesy Balki." Kunal Guha of Mumbai Mirror said: "The film ticks every question it hopes to raise — if every female goes through it, why should it lead to embarrassment or even taint one as 'apavitra'? But it barely alters the squeamish attitude many hold against the routine discomfort biologically assigned to all womankind. And this is where R Balki slips. It was a noble cause for sure, if only the makers would have soaked up some of the melodrama." Mayank Shekhar of Mid-Day said: "This is, in that sense, a very different kinda Balki movie. Pad Man is based on social entrepreneur Arunachalam Muruganantham's life, which has already been made into two feature films that we know of - the unreleased I-Pad, and Phullu (2017) - besides a full-length documentary, Menstrual Man (2013). Having said that, none of those efforts would have had the legs to travel as wide as this Akshay Kumar entertainer (with a lovely soundtrack), spreading a message that is impossible to ignore in a country where, as the film informs us, only 12 per cent women use sanitary napkins at all. The rest simply can't stay free from likely infections, diseases. So you know where this film is coming from. I'm actually really glad to know where it's going. Period." IANS: "Overall, though entertaining, Padman is like a long-drawn public-service film that's worth your ticket money." When a film, besides entertaining, empowers & creates awareness.. its a winner all the way! #Padman is just that. It’s brave & not preachy. An absolute must watch! Incredibly courageous !!! Totally bowled over #PadMan .. this enduring story will touch your hearts & will you inspired ! Respect & kudos to the entire team ??? @akshaykumar @kriarj @mrsfunnybones #RBalki @radhika_apte @sonamakapoor & #ArunachalamMuruganantham ?? Thank you @rbalki @kriarj @akshaykumar @sonamakapoor @radhika_apte for making #padman ..such a delightful film..
#Padman @akshaykumar delivers arguably one of his best performances loved him in the film @radhika_apte u are so real ur performance is flawless @sonamakapoor loved ur character and zero make up look it’s endearing & u really feel for pari ? #pcsriram is a god !!! Everybody must watch @PadManTheFilm It’s endearing, inspiring & beautiful! Loved it #balki @akshaykumar @radhika_apte @sonamakapoor @mrsfunnybones & your awesome cast & crew. And FULL RESPECT to the original #Padman #ArunachalamMuruganantham ?? ?